While we may not be able to influence our kids’ choices once they hit teen town, we can sure do a lot while they’re our little precious ones. There’s no denying many of us parents dream of bringing up a super-talented kid, however, a parent’s love should be unconditional and we should all accept them as they are. That doesn’t prevent us from giving them some direction though. Working as a semi-professional guitar player in my free time, I hear lots of stories that begin with the sentences “I love listening to music. It’s such a pity my parents never bothered to help me nurture the musician within me”. So, in order to avoid making my kid’s life a double trap by either doing nothing to influence him to become a musician as well, or push him too hard, I opted for the middle ground which consist of three simple steps: suggest, support, summarize. 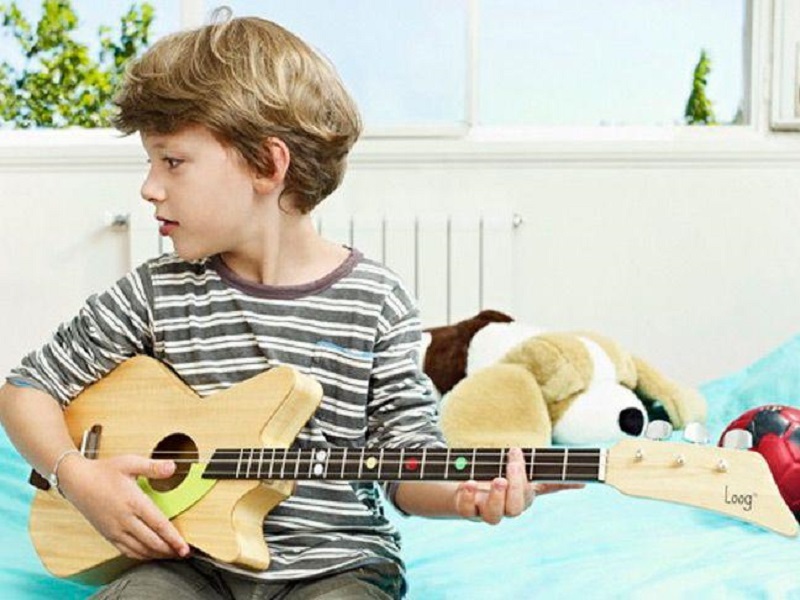 If your kid has already shown interest in playing guitar, great! If that’s not the case, you can talk to him/her regarding how they feel when listening to this instrument and whether they can picture themselves playing it. After you’re done with the suggestion part, unless you’re one of those wicked parents that talk a kid into trying something out and then offer them the air version of the thing (chuckles), you need to get your son/daughter a real kids guitar. While on the topic of the instrument itself, make sure you get a kids guitar with three strings. These guitars are specialized for children’s bodies since they feature a narrow neck which makes it easier for little fingers to hold and play notes and chords on. This doesn’t mean that in future they’ll have hard transition to a six string guitar, quite the contrary, their fingers will be better prepared for playing solos and they’ll feel more confident all the way since these specialized guitars make it easier for a kid to begin playing whole songs sooner. The support step focuses on providing the conditions for your kid’s practice and your willingness to commit to positive reinforcement. Creativity and talent can only thrive in positive environment, especially when you’re picking up a skill for the first time. So make sure you praise every small success and try to not even mention the mistakes, unless giving constructive criticism at the right moment. Finally, in some rare cases, a kid may be talented and have all the perfect conditions, but something else will grab their attention more (like sports or maybe another form of artistic expression) and you are going to have to deal with it. In order to avoid having your kid hide their real feelings just because you made so much effort, you’ll have to have an open and honest conversation whether playing the guitar is their thing or not. Regarding the lesson themselves, if you are a musician like myself, you’ll sure be tempted to take the matter in your own hands, however if that’s not the case, there are many wonderful online courses (if you cannot find something locally). Some of the newest models of kids guitars even come with free learning apps, so make sure you look into that.